When introducing a new medium, we often want to share many techniques with our students. But, time doesn’t always allow us to dig as deep as we’d like. We don’t want to feel like our students are missing important information, but we don’t want to waste time with countless demonstrations, either. The solution? Interactive anchor charts! Using an interactive anchor chart to share techniques is an easy way to set your students up for success. Learn how to set one up below. To start, you’ll want to make a series of technique cards. 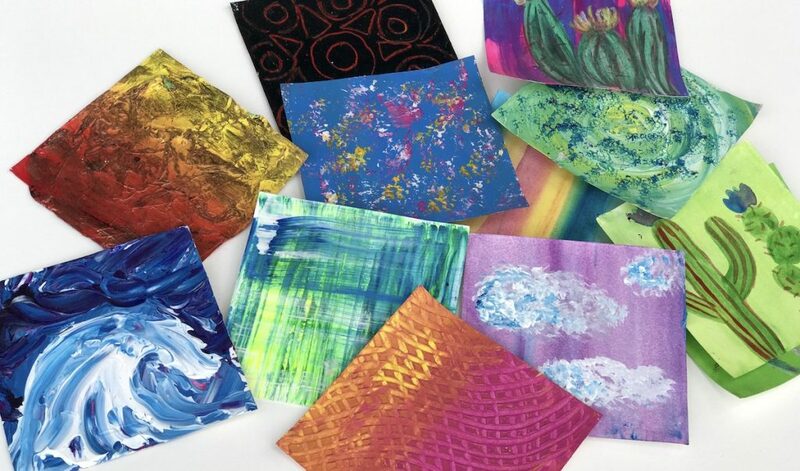 These cards can showcase basic, intermediate, and advanced methods. It’s best to create cards for the techniques you won’t spend as much time going over in your classroom. The idea is that students will use this chart to explore more on their own. It’s an easy way to differentiate learning. You’ll want enough choices to keep kids interested, but not so many they’re overwhelmed. Seven to ten is a great place to start. Our students learn best by seeing. But, it’s not feasible for us to stop what we’re doing to show our students new processes all the time. 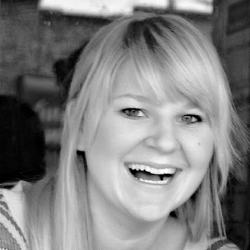 Instead, maximize your time by creating flipped content for each technique. This way you have a bank of resources for your students you can use over and over again. 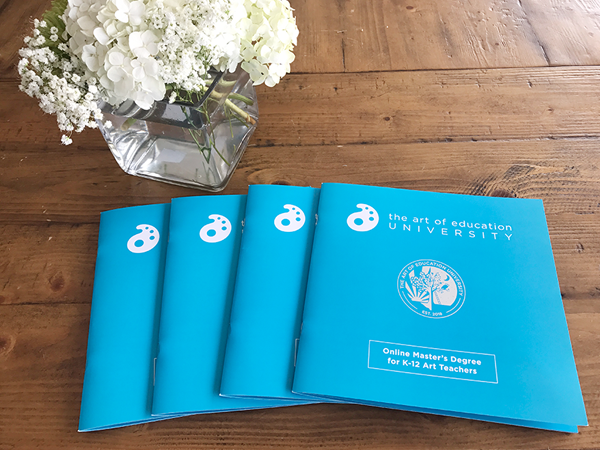 If you’re looking for in-depth information about flipping your content, you’ll want to look at the AOE course Flipping the Art Room. You’ll learn to successfully record video tutorials and create handouts to assist in your instructional delivery. Or, if you’re looking for a brief overview to get you started right away, try the Flipping Your Classroom Basics PRO Learning Pack! Here is an example of a flipped video you might use in your classroom. You don’t have to create an individual video for each technique. In fact, it might be easier to create one longer video that shows many techniques. We’ll learn how to create a link to a specific timestamp in a longer video below. Once you have your flipped video content created, you’ll want to upload the files into a video sharing platform like YouTube or Vimeo. Generating a QR code is simple. I’d recommend the QR Code Generator because it is free and easy to use. Start by copying and pasting the link from the video into the QR website and a QR code will generate for download. If you’d like to take a specific segment from a YouTube video, follow the steps below. Find the time in the video you want to link to and pause your video. Right click on the video. Doing this will make it easier to utilize the video content while ensuring each technique card has a corresponding QR code. 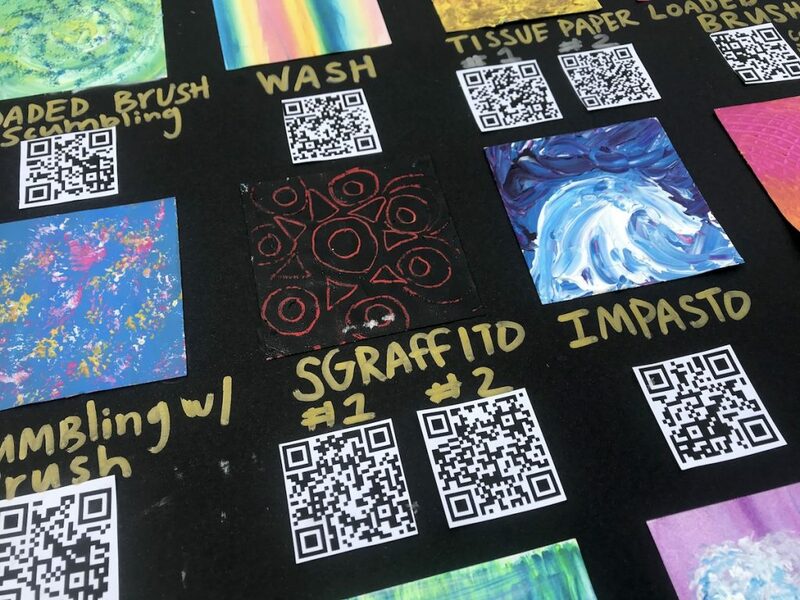 Once you have generated a QR code for each technique, you are ready to set up your interactive anchor chart. Setting up the display is the easy part. Consider creating your anchor chart on poster board or excess mat board. 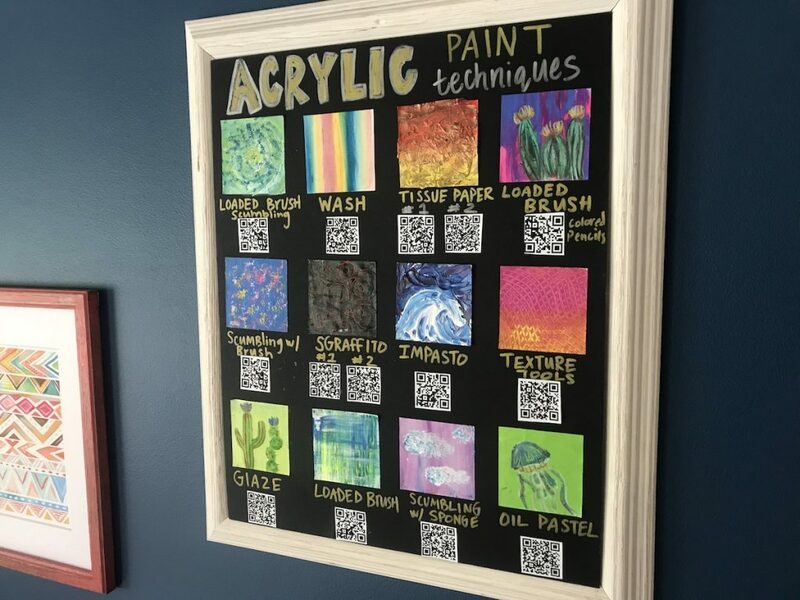 Start by attaching and labeling your technique cards, then add the corresponding QR codes. If you have in-depth techniques, you might need multiple QR codes. Make sure you leave enough space if this is the case. Once your display is complete, it’s time to use it! The best part about an anchor chart like this is that students can use it independently. 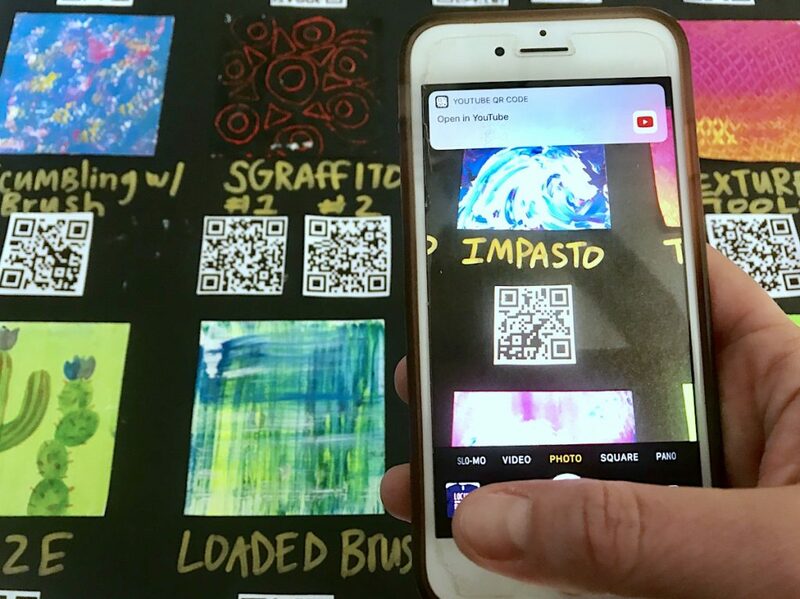 If they are struggling with a technique or want to learn a new one, they simply need to open the camera setting on a phone or tablet and scan the QR code. 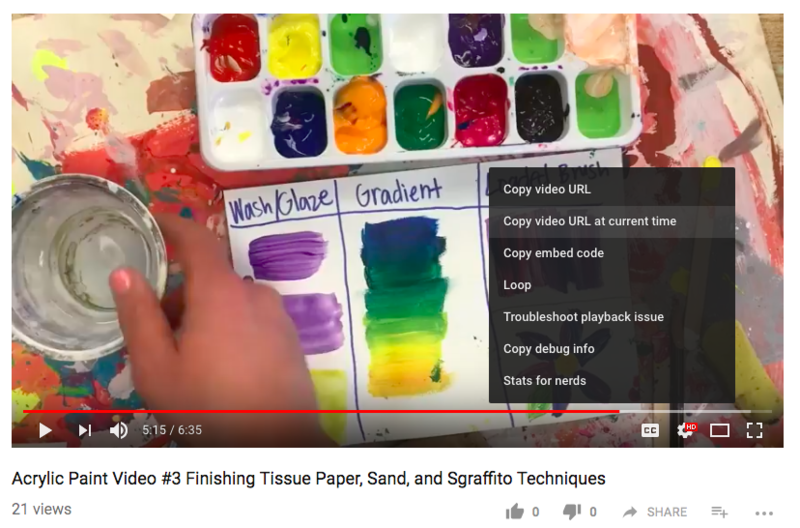 The corresponding technique video will appear, and students can learn at their own pace. Anchor charts are excellent tools, but sometimes students need more than just a visual example of a process. Setting up an interactive anchor chart like this will allow students to review and learn new concepts relevant to their process. Have you ever set up an interactive anchor chart? What’s your favorite way to display anchor charts in your classroom? Relevant, excellent, and techy — thank you, Abby. Thanks Tracy! I hope you find it helpful. these are great! if you wouldn’t mind sharing, what type of projects have your middle schoolers used these techniques with?